A fat face, in the same school as "MegaSpacer", but this one has more bulk and huge differences between thick and thin. And it comes with upper case characters. Info: Created on 27th October 2010 . Last edited on 28th October 2010. Congratulations! FontStruct Staff have deemed your FontStruction worthy of special mention. “Piquance” is now a Top Pick. Thanks Meek for "top picking" this (and other of my recent stuff). 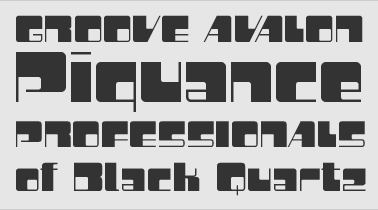 Fixed some missing glyphs, refined some odds and ends. But, most importantly, swapped the standard and alternative "A" (see new sample). And thanks everybody for nice comments on my dabblings.